Last night I joined a couple of buddies for a happy hour drink. With that in mind I put together a dinner that I could cook and assemble quickly once I got home. Broiled chicken and vegetables seemed perfect. Before I headed out to the bar I got all my veggies cut. Asparagus, red pepper, yellow pepper, and a half onion. I set them aside and covered so that they wouldn’t dry out. I also trimmed up some skin-on bone-in chicken thighs and kept them covered in the fridge. After getting the ingredients prepared I ground a tablespoon of fennel seeds with my pestle and mortar. I mixed them into a quarter cup of olive oil and let that sit. Then I made the mustard sauce. 1 tablespoon of fresh thyme leaves, 1 tablespoon of rinsed capers, 2 tablespoons of mustard (I use Boetje’s, use whatever is on hand), the juice from a half lemon, 4 tablespoons of olive oil, and some black pepper. That all got stirred up and left in the fridge. Then I rinsed some rice, put it in the rice cooker, and set the timer so it’d be ready once I got home. When I got home I put the rack in the upper third of the oven and turned on the broiler. I laid the chicken thighs and all of the veggies on a baking sheet and brushed the fennel seed olive oil over everything. I salted and peppered and then put everything under the broiler for about 15 minutes. 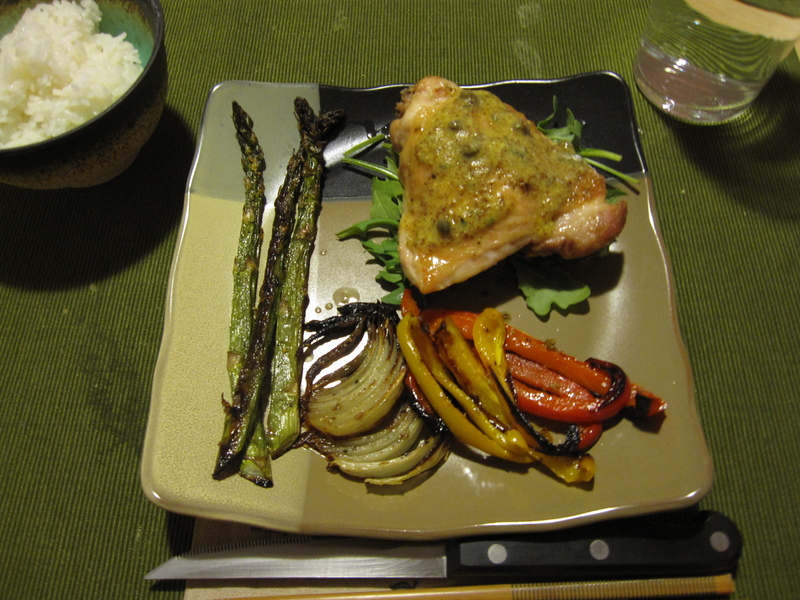 At that point the veggies were carmelized and the chicken a little crispy and fully cooked and juicy. I served the chicken on top of a bed of arugula and laid everything else out on the plate. Then I drizzled some mustard sauce over the chicken. That’s it, time to eat.